No matter who you’re voting for, there’s been some fantastic graphic design this year. We certainly wouldn’t want to editorialize either way, but by the end of today, the American people will have put one of two individuals in charge of the most powerful country on earth. On the one hand, there’s Hillary Clinton, who could become the first female president in U.S. history. On the other, the Republican candidate, Donald J. Trump, who–if he wins–will mark another U.S. presidential first: the first translucent sack of asbestos shavings, off-brand bronze toner, and microwaved Silly Putty to be elected to the land’s highest office. Like we said, we won’t editorialize on who we’d prefer to win the presidency. Unless you’re a red-capped goon reading a printout of this article inside a blood-spattered white van come January 21, 2017, in which case: Go Trump! Otherwise, we’d just like to point out that plenty of other publications have editorialized upon this election season . . . and in doing so, created some of the most memorable cover designs of the year. As this nation hits the polls today, and as we all scream silently into our collective brown paper panic bags, let’s take what may be our last chance to admire some of the 2016 election’s best magazine covers. Under creative director Rob Vargas, Bloomberg Businessweek‘s cover designs have tended toward a fun, colorful aesthetic influenced by internet memes. For this April 2015 issue on the Clinton campaign’s earliest days, though, Businessweek borrowed the design language of manufacturing safety signs to highlight what it saw at the time as the likelihood of the Clinton camp fracturing under the strain of another presidential run. This strangely prescient cover, created from a photograph by Bobby Doherty, accurately predicted the reality of this year’s election–that women, at the end of the day, would be the ones who would either put or keep Trump out of the presidency–with one simple, stirring image: a well-manicured finger stabbing to the sky. Barbara Kruger’s powerful “Loser” cover for New York magazine could (god help us) end up being this election’s “Dewey Defeats Truman!” but it’s still an amazing design, reducing Trump down to his basest, ugliest, and most primal qualities. Tell us how you guys really feel! Unveiled after Donald Trump first launched his presidential bid, no one would mistake this New York Daily News cover as being sophisticated or subtle. But it is unforgettable . . . a great example of how well even the dumbest idea can work, when you go all in on the concept. Nigel Parry’s cover for the February issue of Esquire brands Donald Trump as America’s hater-in-chief and “the unlikely face of American anger.” Part of what I think works so well about it is how Trump’s eyes are seemingly drawn to the headline itself. He’s angry about it, but he’s not going to deal with it now, instead choosing to file it away in some pocket of RAM in his brain devoted entirely to the pursuit of long-term vengeances. 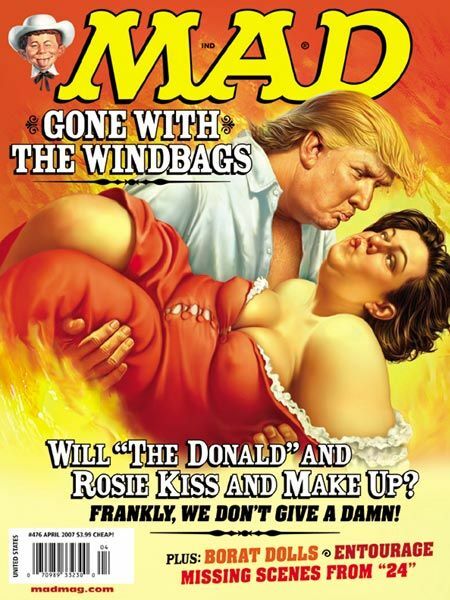 America’s preeminent satirical magazine for 12-year-olds definitely isn’t going to skimp on parodying a candidate as bombastic and mockable as Donald Trump–this one, in particular, is amazing–but I also love its October 2015 treatment on the Clinton campaign, featuring Hillary as Imperator Furiosa and a muzzled Bill Clinton as Mad Max. But where’s Immortan Don? We might be cheating a little bit here. This cover to the New York Times Magazine dates back to January 2014, when another Hillary run at the presidency was still just a glimmer in everyone’s eye. The content of the article, though, speculates on what such a run would look like, while the image itself–Hillary’s smiling head blown up into a fleshy faceball–is totally unforgettable. This matryoshka-like cover, for a cover article entitled In Search of Hillary, shows the many faces of Hillary Clinton. It peels Hillary back like an onion, visualizing all the people she’s been in her life: a student, a lawyer, a first lady, a senator, a secretary of state, and now–potentially–a president. But by giving Hillary only one face, it makes an important point: This is a leader who has been, at her core, the same person from the very beginning. Could any cover better summarize the Gary Johnson campaign? The choice of photograph here is key: It seems to have been taken from under a table, a first-person view of an unlikely candidate from a literal underdog. The most effective covers this election season have tended to be simple and stark. That’s certainly the case in Reason’s Trumpland cover, a twist on Donald Trump’s earthy, ubiquitous “Make America Great Again” trucker caps. It manages, somehow, to say everything about the voters who support Trump–not so much those who have actually been left behind by the system. Barry Blitt has done the majority of New Yorker‘s amazing covers this election season, but the one slated to run next week is particularly brilliant, because let’s face it: No matter who wins, it’s going to sum up the experience of a full half of us.